It will be East-meets-West, on Friday, June 22nd, from 7-10 pm, when you, your fellow Members, and guests are invited for a refreshing departure from the ordinary. 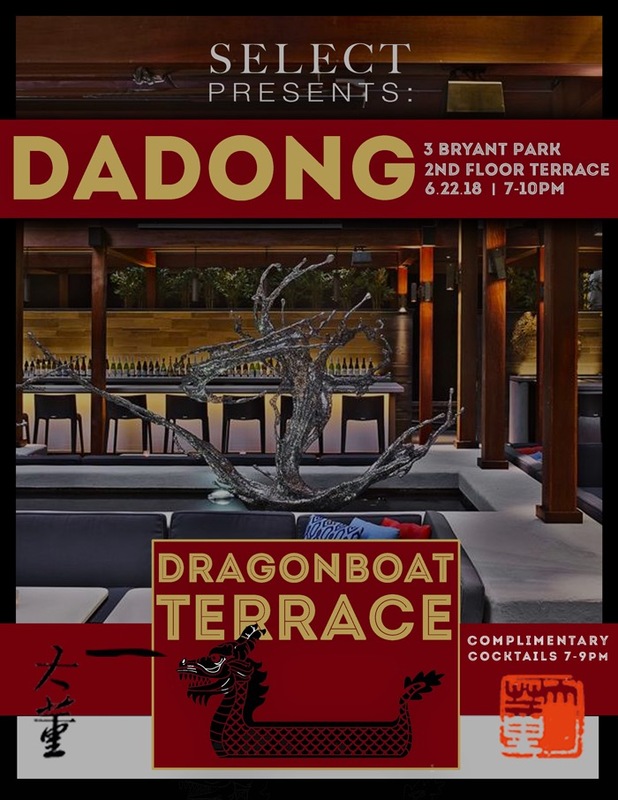 For this special SELECT event, we’ll gather at the stunning 2nd floor terrace of DaDong, near Bryant Park, in celebration of the Chinese Dragon Boat Festival. Make your appearance at this chic cultural locale and enjoy two hours of complimentary refreshments; including unlimited red, white, and rosé wines, frozé, beer, and an unique DaDong-crafted cocktail from 7 - 9 pm. As part of this summer soirée, we’ll also enjoy themed accoutrements, including delicious passed hors d’oeuvres, vintage dragon boat races on projection, photo-booth, and the live beats of Chinese import, DJ Xiaojie Wu. We look forward to seeing you there.